One of London's busiest and most popular market areas of the West End, Covent Garden, was originally the UK's largest fruit and vegetable market, the inspiration for the musical hit, My Fair Lady. 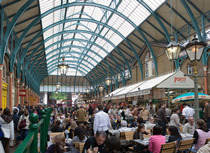 However, Covent Garden has long since improved and is now a bustling destination for both tourists and Londoners. It is now most well known for the street entertainment outside in the Piazza and the varieties of shops inside and outside of the Central Market. The Central Market, designed by Inigo Jones, originally housed the fruit and vegetable market traders but now encloses cafés, arcades of shops, restaurants and small market stalls selling souvenirs of London. As one of London's only licensed areas of street entertainment, magicians, jugglers and mime artists continue to attract large crowds throughout the day.